WASTE kicked off as a special dinner party in November 2011 as part of the International Conference for Reconstruction of Japan – an alternative post-disaster conference being staged at PICA by visiting Japanese activist Sakiko Sugawa and her collaborators Keith Pasco (USA) and Sam Fox (local). 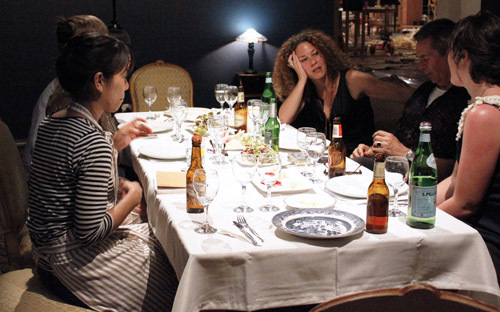 At the WASTE Dinner Party, participating artists were asked to discuss their ideas and anecdotes about the unseen or immaterial waste within our culture. The dinner revolved loosely around hopes for the reconstruction of our respective societies – Japan and Australia. Artists were served food and drink by the ICRJ convenors prepared by food collaborator Keith Pasco. 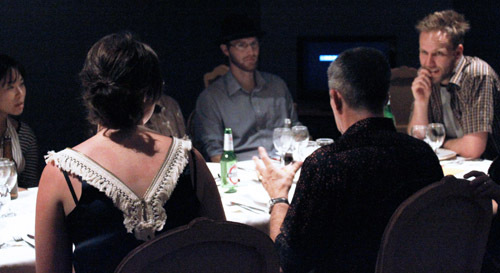 This dinner is one of many that have occurred as part of the International Conference for Reconstruction of Japan. Studio nights begin in September 2012 to invite new contributors to this open platform and progress possible outcomes for the WASTE project. The website is almost ready. Images courtesy of ICRJ, Sakiko Sugawa, PICA and Zeb Parkes.